Centre of the globular cluster Messier 12 as observed with the FORS-1 multi-mode instrument on ESO's Very Large Telescope (Cerro Paranal, Chile). 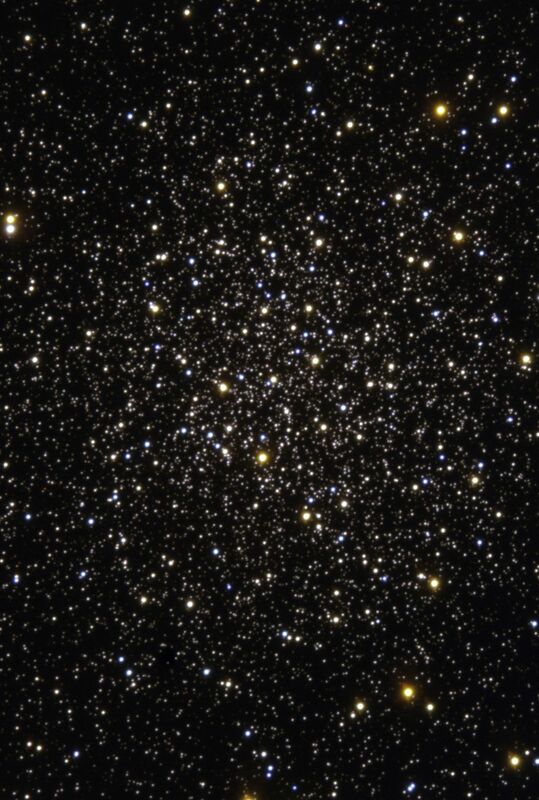 The picture covers a region of about 3.5 arcmin on a side, corresponding to about 23 light-years at the distance of Messier 12. It is based on data in five different filters : U, B, V, R and H-alpha. Here only the short exposures were used while for their scientific analysis, the authors used much longer exposures. Guido De Marchi (ESA) reduced the data and Kristina Boneva and Haennes Heyer (ESO) did the final image processing. The observations were obtained with very good conditions, the image quality ('seeing') being around 0.6 arcsec.